Here is the next part in this series, continuing on where we left off. I wasn’t planning to make this such a long series, but I’ve got one more part after this one, with some really practical tips. Garage sales are the biggest gem of them all. I usually don’t pay more than $1 a piece, and often less. Try to hit the ones in nicer neighborhoods, because you will find oodles of name-brand clothing in excellent condition, and the people mostly just want to get rid of it. The best thing about the kid swaps is that there are tons of different tables, with every size from newborn even up to size 8 or 9 etc. all under one roof so you can usually find everything you need, unlike garage sales which are so much more hit and miss. Try calling local rec center to find out if any are happening in your area. This and the picture below are from the last time I went to the swap meet. Just to give you an example, up above you see 4 pairs of shorts, a pair of jeans, a pair of khakis, 3 button up shirts, one light jacket, one pair of pajamas and one sleep sack. Below is Abbie with her stash, which consists of 5 long sleeved shirts, 4 t-shirts, 3 skirts, one fleece hoodie (she’s wearing it already), one windbreaker, and 4 pairs of pajamas. The total for both pictures was about $48, including my entrance fee. Nearly everything is name brand and in excellent shape. Thrift stores in Canada are definitely charging too much for their clothing these days, but they can still be valuable. It’s nice to be able to just walk in and find the section you are looking for, to get those few items that you need to fill in the gaps. Sometimes they’re great for things like jackets and shoes. My best experiences are on 1/2 price days, like the one I just shopped at Value Village. It took me over two hours (with a bit of shopping for myself mixed in, of course) in a crowded store with two little ones, but it was worth it. 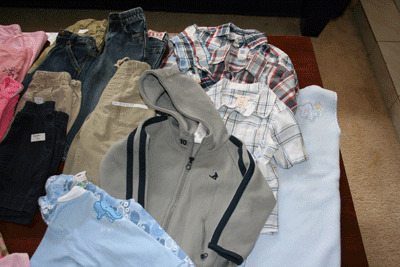 I came away with a good 20 items that were still on my list for the spring/summer/fall, paying between $1-3 per item, including a really nice Carter’s winter jacket for my little guy, as well as a pair of runners and a pair of casual dress shoes for him, and several adorable dresses and sweaters for my daughter. Retail clearance is definitely pricier, but still occasionally worth it. Especially if you are planning to have lots of children, and here’s why. We’ve been blessed to receive several gift cards to Gymboree and Children’s Place for our kids. With these, I have either scoured the online clearance sales or shopped the sales at the outlets. The clothing I have been able to by is very high quality (especially Gymboree), and I’m confident it will last through at least a couple of children, which sometimes makes it worth it to pay more than you would for used. Where do you most frequently buy your children’s clothing? What are your strategies for where and when you buy? How do you raise kids without all the clutter? These are all great ideas. When my daughter was little we only had garage sales. I was lucky my daughter was the first grandchild and an only for a very long time which meant I got lots of gifts, all the time and I didn’t have to buy here much of anything until she close to the teen years. I read a site after christmas that went to the outlets/sales and bought tons of clothes for 1/4 of the price for the year. I wish we had swap meets here. I have often thought about trying to get one started, but I can’t do that sort of thing for a long time. Like I mentioned before I also find the best deals at garage sales. Second to that would be thrift shops, thankfully we have a very nice, clean and organized salvation army in town (some towns aren’t so clean…)I find the best time to go is when they have the change of season’s clearance, but each store is different so they might not all have that. I’ve been to value village half price days but it is definately busy. Its hard to even get a cart. We don’t have one where we live anymore so we use the coupons when they are good. We plan on using the one for March, buy $50 or more and get $25 off. Both my husband and I will try to find $50 each of stuff (for us and the kids, mainly our older girl) and then go through the cash with two coupons, seperately, so we each pay about $25. If we don’t find that much we will just use one coupon. It all depends how it goes. Some days we find nothing really worth it! Or before we have also gone with my mom and then put it all as one grouping of stuff at the cash register and she’s paid us back after, so we all get a deal. Would work the same with friends.We paid $1.99 each calendar(we have two). My MIL uses them with her kids (teens and young adults) and buys each one a calendar in December! I know people say that you “can’t” shop like that for teens but they have to and do, and they all look great! Another idea too is if you have a local consignment shop sometimes they have email lists, so I know one around here that emails out when they have sales. Like 50% off, we have been able to get some good things there that are great quality for more like yard sale prices but I might have missed knowing about the sale otherwise. I have found used boys’ pants very hard to find, so those have become what I buy on clearance at retail stores. I like to try and combine the retail purchases with another coupon from the mail or a great sale so I get them even cheaper. Just last week, I got 3 items for $10 at Kohl’s all at 90% off. I definitely prefer new pants for my boys so they don’t wear out so fast. I never seem to have the time to hit up garage sales. We have some great consignment stores here. They are a little pricier, even than thrift, but they have been great for coats and shoes and filling in the gaps. One of the schools here has a semi-annual huge consignment sale with clothing for all sizes. It is where I find most of the clothes for my kids. Back in early December, my husband and I attended a huge indoor yard sale at one of the churches in our area. We went initially looking for toys, but found plenty of kids clothing, big name labels and in excellent condition, for .50 – $1 a piece! Much better prices than even our Goodwill’s. It turns out this church holds three gigantic indoor yard sales a year to benefit their missions programs. I already have the spring date marked on my calendar! My biggest challenge still remains pants and shoes for our daughter. She seems to wear through those much faster than our boys! I usually rely on the Target clearance racks for those. We have outlet stores, such as JC Penney Outlet, and I often find brand name clothes for very little. The whole family finds great clothes at these stores, not just the kids. In addition, you can also find other great things at outlet stores for your home at very reasonable prices. I haven’t had a whole lot of success with garage sales, but I have done well with consignment sales. They are usually hosted twice a year in my area and the last day everything goes down to half-price. So, I can often get garage sale like prices there. I’ve also been blessed with friends who have passed on their clothes to my boys. Now that is really nice! Free! It also helps that I’ve only had boys–I have two currently and am expecting our third in July. I only have one gender to buy for! Although, they seem to be pretty hard on their clothes and they aren’t lasting as well as they used to the older they get. 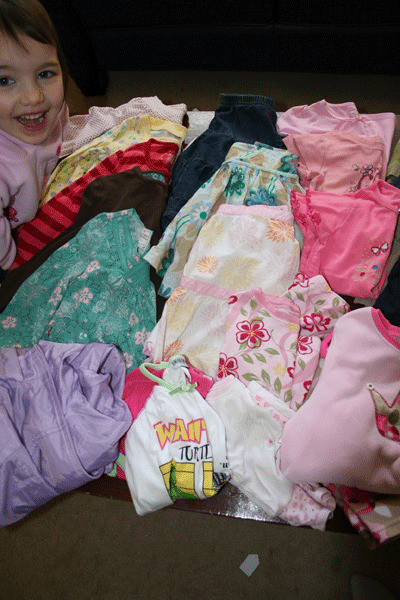 I Bought my kids clothes at these Thrift swaps and at the bargain stores when they were younger. But being almost 10 and 7 it is alot harder to get their clothes in their sizes. So I have to rely on hand me downs (which we love from friends, but happens more for my son than my daughter) and store sales. This means I buy ahead but the discount makes up for that. My kids do not care if they are new or used as long as they fit nicely and comfortably and is the right color! I went to the last Kids Swap and found sweat pants for Ike and the next size up sleepers for Eli and a birthday present for Journey (kids cook book like new) all for great prices. I also found a local girl who carries my prefered diaper wraps. I love buying locally when possible. Last year I bought all my maternity clothes @ (Guilford)Old Navy. I paid an average of $5 per pair of jeans and tops. I will Craig’s List these and easily get back what I paid. I simply check regularly for their sales. I also have friends who let me know when they hear about it themselves. I agree about the thrift store prices here. Great ideas here! I love looking in the clearance sections- especially at The Gap. You can definitely get some great buys. I bought my daughter a dress for her dedication for $5 there. And it had beautiful details on it. I do have a question regarding shoes. I remember reading somewhere that it is not a good idea to pass on shoes because they mold to the feet of the one who is wearing them. Do you have any thoughts on this? I guess it is probably OK for shoes that are only worn occasionally. I never reject anything anyone gives me as far as hand-me-downs. I usually search through and weed out the out of style or very worn clothes and keep the rest. But I think if you willing accept stuff, then the “giver” is more likely to keep you in mind for more stuff as their children grow. I also like garage sales. Occasionally, I’ll find someone desperate to clear out their clothes. I found one lady who told me to fill a grocery bag for $1. They aren’t always the “best” clothes, but great play clothes and fill ins. It’s nice to have a few nicer outfits the kids can wear to special occasions or church and I’m willing to pay more for those. I saw the last poster commented on used shoes. I try to buy only used shoes that aren’t worn much for much the same reason b/c I don’t want them to have foot problems due to badly fitting shoes. Plus, my daughter has wide feet like my husband, so I think it’s necessary to have those fitted properly. I probably spend more on my kids shoes than other areas but b/c I save in other ways, I think it’s ok. But again, even at yard sales you can find a pair now and then that are barely worn. Not having much luck with our local thrift stores. They are not very clean and they don’t have a lot of kids clothes. I do have to admit though that I LOVE to shop at our local outlet mall. They have Carters, Childrens Place, Gap etc and I can find new clothes there for the same price that the local thrift store is selling them for, $2-4. I am excited for garage sale season start soon! I am hoping to find some good deals! I also shop on eBay. I just found a winter jacket for next for my son from Lands End NEW extreme squall jacket for $10!!! I was SO psyched! I LOVE saving money anyway I can…it certainly helps our financial situation but it is also a game..LOVE it! Thanks for all your good ideas! I like to shop the clearance racks, mostly at Target. I also shop at garage sales and Once Upon A Child. OUAC has higher prices, but it is good if you are in a pinch. I recently discovered a consignment sale called Just Between Friends. They have sales in various states in the US. You pay a few dollars to get in, but they usually waive the fee on the last day and also have everything 50% off on the last day. Things go fast on the last day though! They not only have clothes, but also everything baby/kid (furniture, toys, books, strollers, play gyms, etc.) They are only in the US, but your reader’s can check and see if there is one near them at jbfsale.com. My mom and I go garage saling all summer every summer, and if you go to the right neighborhoods, you can get some reeeeeeeally nice stuff, for your kids and yourself! Also, I LOVE Value Village!!!! It’s like the Nordstrom of thrift stores…. and it’s sooo cheap! I rarely buy new clothes for me kids, but here is how they get clothed: 1. gifts from grandparents (which are nice b/c they often include Please Mum and Children’s Place), 2. Goodwill – the color tags on sale change each week so I try to go on Monday to find the 75% off stuff, but I will buy at full thrift prices for good brands and great condition, 3. Our church has a FREE exchange twice a year where folks bring in their excess and the congregation and community come to shop for free (this is such a blessing! ), 4. hand-me-downs when they are offered, 5. retail clearance at 75-90% off or slightly more if the item comes from a place like Lands’ End with excellent guarantees – sometimes as a gift from us for their birthday, 6. trying to get to more garage sales this summer than I have in the past. When I am the one choosing the clothing (i.e. not gifts), I try to select some basic items that could go through several kids and are good for both boys and girls, like khaki or navy pants, jeans without embellishment, coats in navy or green that could be paired with scarves and hats that will be more gender specific. I also don’t like them to have too many in any one size because I find I actually stay on top of laundry better when there is less in the rotation. Oh, and I never buy items of clothing with characters just as a matter of personal preferrence and because I don’t think they mix and match as well as plain items. What a timely series for me! I’ve been sorting through my kids’ clothes and paring down over the past few days since we have too much and posted on my own blog about how much to keep. I’m a shop ahead type, too, scouring end-of-season clearance for next year’s clothes, but my best buys have been from Craigslist lots. It’s been fantastic for getting items in one size, generally in outfits, for very little money. I rarely spend more than $1 per piece and often as little as $.25 per piece. The kids wear the clothes and then I relist them for $1 per piece, essentially clothing them for free. thanks for sharing this post very interesting..especially the place where to shop.garage sales, kids swap meets, thrift stores and occasionally clearance retail sales.I aready know the garage because my mom always went to garage sales to buy some clothes of mine when i was child. nice entry keep posting!